Networks became a frame for thinking and living in our liquid order . This frame has been a shift in gaze from formal organizational entities to the network of actors engaged with one another in various ways. This is the core principle of network theory and analysis. This network turn challenges our notions of society, organizations and education as knowable entities. they are oversaturated with meaning, while borders become less and less defined in our fast-globalised world. In a nutshell, connections became a tool for collective action in an attempt to find local solutions to global problems. In an unbridled global world, connections became a tool of collective and frantic activity of drawing borders aiming against all fragilities. We cannot yet know if this is a vain hope or if it is not. 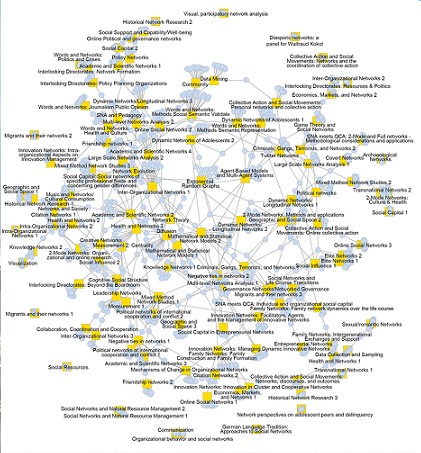 In SNA studies, researchers identify borders or relations and look for its justifications, and then for the differences on the two sides of the borders: how they acquire significance and all the mechanisms and processes that keep the relations. From a hierarchical perspective, connections are fostered by the system and organisation leaders. However, on the other side of the coin, we know that if connections are too individualistic they become merely transactional, less creative and more prone to conflicts. Exaggerated emphases on personal attachments often lead to a lack of clarity and strength and end up on friendship relations. Finally, if connections are too controlled by hierarchies, they most certainly become bureaucratic and unresponsive. What about the evidence that collaboration can make a difference at the various levels of knowledge networks at universities? A study presented by Filipa M. Ribeiro (University of Porto) and Miranda Lubbers (Autonomous University of Barcelona) at the 2013 Applications of Social Network Analysis (ASNA) conference in late August, found that coauthorship should not be equated with knowledge creation. In fact, of all the ties nominated regarding scientific collaborations (on average 6.9 per respondent), only 28% of those ties was deemed important for knowledge creation. The authors investigated the role of the two main interpersonal mechanisms that have been related to the embeddedness in social networks in order to further explore under what conditions network ties are associated with knowledge creation: similarity and tie strength. Similarity refers to the fact that the more similar individuals are the more likely they are to establish a connection. Tie strength is a combination of the amount of time, emotional intensity, intimacy and reciprocal services among two people. The findings showed that: 1) stronger ties are perceived as more important for knowledge creation, regardless the fact that they are or are not from the same discipline or academic position; 2) similarity in position and discipline do not affect knowledge creation. Christoph Lutz and Christian Hoffmann, from the University of Sankt Gallen, studied the potential of academic social network sites for scientific impact assessment. They evaluated new forms of impact in management research in the case of Researchgate. Their findings show that activity on the platform is the best predictor of impact within the network, while publication success plays less of a role. Another interesting finding was that researchers who write together usually don’t follow each other. The two studies reinforce the recent idea according to which collaboration and coauthorship relations should not be the unique indicators to assess the impact of scientific work nor to understand what’s behind scientific creation. So, on one hand, more informational systems and other types of assessment are needed. On the other, a deeper development of network theory combines what we intuitively know with a growing body of network research suggesting that relationships within a system matter in enacting change, flows, diffusion and strategies prior to, during and after any implementation of a change strategy. The importance of this is obvious if we take into consideration the fact that the European space of education is mobilized by networks of actors and constructed by comparative data. In what regards SNA, the field is fertile in methodological, theoretical and even ethical concerns as there will always be merits and demerits of gleaning social network data to complex and multidimensional social problems. However, the approach provided by SNA helps us not to have an atomised view of organisational member and flows but rather an intricate web of formal, informal and changing linkages binding or separating groups, actors and processes. Just like in the glass-making industry, in social network research there is a considerable number of mechanical and structural movements and data that must be synchronised for processes to run smoothly. However, many other variables are at stake as variability, unpredictability and sudden emergence of new situations are glassmaker’s companions. And it will continue to be like that for next 10 years in this bumpy road of social network analysis. Filipa M. Ribeiro is a PhD researcher at the University of Porto and visiting researcher at Egolab Autonomous University of Barcelona. More information on her research can be found here. Bauman, Z. (2000). Liquid Modernity. Polity Press. Daly, A. J. (2010). Social Network Theory and educational Change. Harvard Harvard University Press. Kant,I., (1983). “Beginning of Human History” in Perpetual peace and other essays.Hackett Publishing. This entry was posted in Education, Media & Communications and tagged higher education, knowledge networks, research collaboration, social network analysis, universities. Bookmark the permalink. 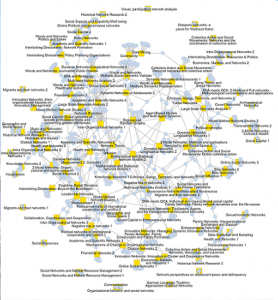 Previous: Whither will the Europe of Knowledge amidst the Crisis? Next: Competing for foreign talent in a globalised world: is Europe losing out? This is scientific journalism in its higher level. Congrats for the writing and for the work done in the ASNA 2013.